Radio Spaceshuttle 13800 kHz, 22mb sundays starting 5th of April 2015 18:00-19:00 UTC. with a regular broadcast on 7700//9335 and 6070 kHz. We will commence broadcasting at 10:00 UTC/ 11:00 BST/ 12:00 CEST. please visit our website: [ www.frsholland.nl]. "Spaceflyers Letter Box" on 9600 kHz, 31mb sunday 22nd of March 2015 18:00-19:00 UTC. Really wishing that our signal can reach you throughout every interference or noise. Please send ideas of programs and music you like to hear from Spaceshuttle. We would like to fullfill your requests in special musical shows in future. 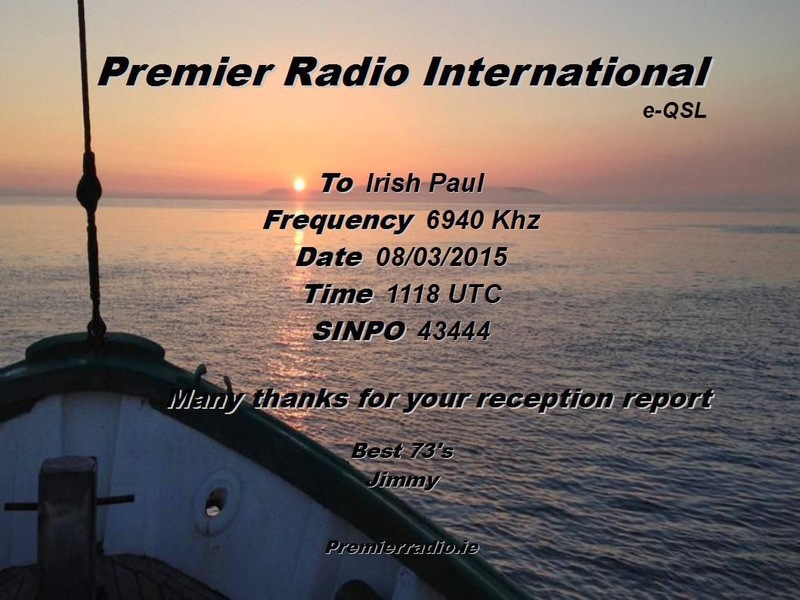 21st March 2015: 09.00 to 10.00 UTC on 9510 kHz via IRRS. 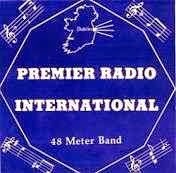 Radio Mi Amigo is testing on 9560 KHz, 10 to 12 CET, Satuarday 21st and Sunday 22nd of March. Please send reception report to: info@radiomiamigo.es - Everybody will get a brand new QSL Card. Alan Gale writes on the British DX Club Yahoo group: "CBSFM International from Ireland are currently testing live on 7820 kHz. Presenter said their service will launch on the 17th of March, and they were asking for reception reports on their signal. They will be closing down at 1800 UTC today, I think. Very strong signal here in the nw of England. CBS FM's djs come from many different countries, but speak mostly in English, the same language as the music. We are your Smart Stereo Hits Source, powered up on your smartphone, tablet and computer. CBS FM International has listeners from Chicago to Calcutta, and from London to Los Angeles, and across Planet Earth! CBS FM International is leading the way in Broadcasting. We are 21st Century Radio,The Home Of Smart Stereo Hits! and it's lots of fun too! For More Info Contact Steve Marshall,CEO,CBS FM International." Full hour with powerful transmitter to omnidirectional antenna. 1. Reports would be sent from transmissions made between January-June 2015. 3. Point will be given from every different transmission from 1st of January until 30th June. Most listening reports sent listeners will win special Radio Spaceshuttle items. Frequencies used of Radio Spaceshuttle until now are 6035 kHz, 6070 kHz, 9600 kHz and 9865 kH<. Dear radio friends, It have been a while ago since our last adventure towards the east continent, i remember it was a lot of fun then, and we got a large amount of listeners at the other side of the world. With this huge flare explosion from the sun i give it a go tomorow on 15 of march. Power will be around 30 0 watt i hope it will do the trick. Time to apply for summer frequencies - please let us know which ones you would like! First of all, we would like to express our thanks to all the broadcasters who have chosen to use our relay facility. Your faith is inspiring and as the time has now come to apply for new frequencies for the period March – October we would appreciate any input from you with regard to what frequencies you would like to use. A thorough frequency planning is essential for reaching out on SW. If you only have one frequency, you will be very vulnerable to interference from other stations. Therefore, we always apply for several spare frequencies. Sadly, all stations do not follow the registrations they have made and interference may occur even if the channel should be vacant at a specific time. We offer you airtime for €30 per hour on two frequencies (5 kW AM plus 10 kW A3H - carrier plus one sideband) or €20 per hour on one frequency. As there are today a number of more or less low-powered SW relay stations around in Europe, we feel that we all could benefit from cooperating. Selling airtime on SW is today such a narrow niche that there is actually no big money in it. Apart from government owned stations, most SW relays are operated by radio enthusiasts who believe in the medium. In the USA we have the National Association of Shortwave Broadcasters, which was set up to represent the interests of FCC licensed international broadcasters. What do you think: could we in Europe benefit from creating a similar organization, where we could agree about frequency planning and other practical details? For some years there have been a number of low-powered stations (1 kW) operating in Germany. Prices for airtime has been around 15 euro per hour which naturally is very affordable to most broadcasters. However, the reception has not been very good in many areas. The Swedish DX Federation used to broadcast over one of these stations but the members requested that another relay station be used in order to provide a better reception. That was the prime reason why the Radio Revival Sweden relay facility was set up. We then decided to offer airtime to other interested parties. Another German station has appeared, claiming 10 kW of power, also charging 15 euro per hour. It is not clear whether this is peak or average power but either way, this rate can hardly cover more than a fraction of the power costs, let alone all other costs for running such an operation. Honestly, we don’t believe that this philosophy is the solution. A broadcaster will want to know that you are a reliable transmitter operator and that you will still be around when needed. We have decided not to step into this cutthroat race and we will not reduce our airtime rate just in order to compete with operators charging extremely low airtime fees. We will, however, continue to provide you with a reliable resource for reaching out to Europe on SW.
We hope that as independent SW operators we can cooperate with other relay facilities instead of competing with each other. Think positive! 3930-20.00 Radio Focus International Playing Rock Music And Oldies Including The Eagles" witchy woman". Strong Signal Sinpo 54444. Not In Parallel With 6285. UTC for our European and New Foundland ;) listeners. antenna to a bit larger listening area. requests in special musical shows in future. innerhalb der nächsten Wochen zu rechnen. sie natürlich auch von uns weitergeleitet. zu ca. 60% durch die Einnahmen aus vermieteter Sendezeit gedeckt werden, ist das leider nicht möglich. Wer uns unterstützen will, kann Nachtsendungen sponsern. Das kann eine ganze Nacht sein, oder auch 2 x 6 Stunden am Abend. Dafür brauchen wir 36 Euro; wem das zu viel ist, der kann auch nur 6 Stunden für 18 Euro sponsern. eingestreuten, von uns kostenlos produzierten Spots (bei Offshore Programme nur vor, zwischen und nach den Programmblöcken möglich). Oder, wenn gewünscht, auch anonym. Ihr könnt auch ein Sponsoring-Abo abschließen; z.B. für jede erste Samstag Nacht im Monat, oder wie es gefällt; jederzeit kündbar. Wer uns hier unterstützen möchte und kann, soll uns bitte eine eMail senden! Zoals jullie misschien al op onze website gelezen hebben, zijn we van 8 tot 22 maart uit de lucht in verband met voorbereidingen voor de tweede eindtrap van de zender. Er is wel een Echter, op 22 maart van 11.00 tot 12.00 uur Nederlandse tijd komt het nieuwe programma van DARC (Deutscher Amateur Radio Club) op 6070 kHz met een vermogen van 100 kW; de zender van 10 kW gaat eventueel al op de avond van 22 maart weer in bedrijf. In de loop van de week daarna is al sprake van een verdubbeling van het vermogen. Omdat de 'dode zone' tegen de zomer ook 's nachts steeds kleiner wordt, krijgen we een toenemend aantal verzoeken om de zender ook 's nachts in de lucht te houden. Dat zouden we graag willen doen, maar we zitten dan wel met het probleem dat dan ook de elektriciteitskosten in één klap verdubbelen, hoewel de inkomsten niet omhoog gaan. En aangezien deze kosten (en andere zaken nog buiten beschouwing gelaten) al zonder nachtuitzendingen slechts voor zo'n 60 procent gedekt zijn dankzij de inkomsten uit de zendtijd die we verhuren, is het helaas niet mogelijk. We vragen jullie eigenlijk ook niet direct om een gift, maar we hebben wel een voorstel: wie ons wil ondersteunen kan nachtuitzendingen sponsoren. Dat kan een hele nacht zijn, of ook 2 x 6 uren 's avonds. Daarvoor zijn we 36 euro nodig; wanneer dat te veel is, kun je ook slechts 6 uur voor 18 euro sponsoren. De sponsor mag zelf beslissen of in 'zijn tijd' onze reguliere muziekprogramma wordt uitgezonden, of een herhaling van een zeezender naar eigen keuze. Als je wilt, zullen we de naam van de sponsor op onze website en in het nieuws vermelden, evenals in het kort in het programma met door ons gratis te maken spotjes. (bij de programma's van de zeezenders is dat alleen mogelijk vóór, tussen en ná de programmablokken) of, als je dat wilt, ook anoniem. Je kunt ook een sponsor-abonnement afsluiten, bijvoorbeeld voor iedere eerste zaterdagnacht in de maand. Het abonnement kun je op ieder moment opzeggen. Degenen die ons op die manier willen en kunnen ondersteunen, verzoeken we om ons een mailtje te sturen! we hope that we can increase power as planned. in the evening. For this we need 36 €; who can't afford this, may book 6 hours for 18 €. Or, if wanted, completely anonymously. Or you subscribe for maybe every first Saturday night each month, or how you like; can be canceled at any time. If you like to support us in this way, please send us a mail! 6300-9.25 Cupid Radio Playing Dance And Rap Music, Followed By The Radio Hobart International Program. Good Signal Sinpo 43444.